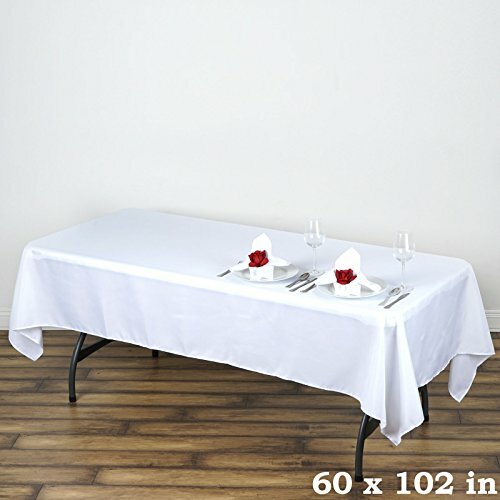 Premium Tablecloth Our NEW Premium Line has the same, no hassle design as all our other tablecloths! Simply open the package, put over your table and done. Not to mention, it looks great! It looks graceful! And youve saved yourself so much time from ironing or getting an iron. So if youre willing to spend a little extra for something you no doubt will want to use many times over due to its quality and sheik style, then this tablecloth is definitely calling your name. So try it out and put together an exclusive-looking event in record time. Additional Info: Material: 220GSM Premium Polyester Wrinkle Resistant, Stain resistant. How to Care: Warm water wash. Low temp dry. Can be reused again and again, easily over 100 times. Seamless, 1pc design. Material: 220GSM Premium Polyester Wrinkle Resistant, Stain resistant. How to Care: Warm water wash. Low temp dry. Can be reused again and again, easily over 100 times. Seamless, 1pc design.